A photograph of flooded Water Street, taken from the Provencher Bridge, during the 1950 flood in Winnipeg. This photograph was taken before the causeway down Water Street was built. 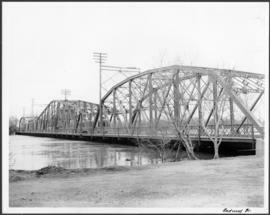 A photograph of the building of the Water Street causeway during the 1950 flood in Winnipeg. St. Boniface Cathedral can be seen in the background. A photograph of a large pump on a residential street during the 1950 flood in Winnipeg. An aerial photograph of flooding during the 1950 flood in Winnipeg. The photograph is looking down on the Provencher Bridge and downtown Winnipeg. A photograph of vehicles driving down the Water Street causeway to the Provencher Bridge during the 1950 flood in Winnipeg. A photograph, taken from the north, of a flooded underpass on Anabella Street during the 1950 flood in Winnipeg. Some people in a boat are travelling down the street.